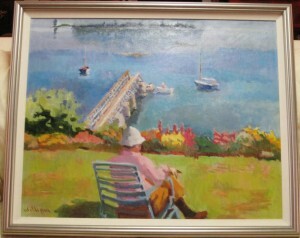 Description: Original oil on linen. Pinehurst, NC artist. Scene from Eggemaggin Reach, Maine. Hello, I looking for the Value of my large portrait 33″ x 42″framed, painted by Joan Milligan in 1980.If at all possible I would very much appreciate it. I see some of her work in your gallery .